Destiny 2 introduces a brand new collection of exotic weapons for fans to crave over and admire. In this post you'll find a complete reference list for all of the new Kinetic, Energy and Power exotics in Destiny 2 including their exotic perks and how to get each of them. With the introduction of Guided Games, Lost Sectors (dungeons) and even treasure maps, it's going to be a much more accessible version of Destiny this time around. 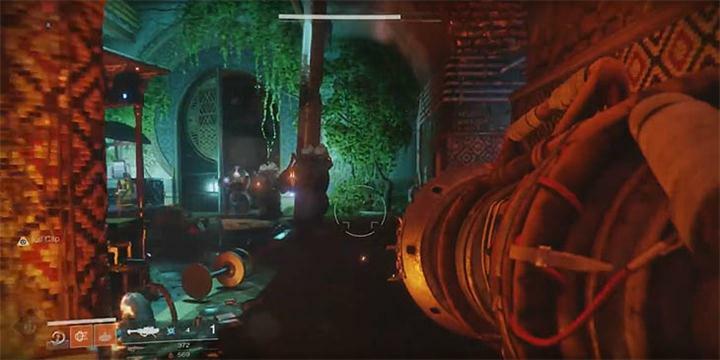 Many of the games previously impossibly hard to find exotics, that were either hidden inside Raids or behind insane collection processes, will be more open to every player. First up, let's start by addressing that this is an ongoing reference guide that will be updated with new information as and when it's revealed. So far we already know about a handful of exotics from the gameplay event that followed the live reveal, such as Sweet Business and Wardcliff Coil (aka Dubious Volley), but the complete list will no doubt expand during the Beta and the official game release milestones. Intrinsic Perk: Accomplice Kills. Kills with this weapon fill the magazine of the equipped energy weapon from reserves. Sturm is a Hand Cannon from the Kinetic class, with an exotic perk that automatically fills your energy weapon from reserves following kills. Sturm also has additional benefits when used in conjunction with the Legendary sidearm "Drang". Getting kills with Drang, activates Sturm's trait perk called "Storm and Stress" which grants bonus precision damage until the next round. How to get it: See the Sturm exotic guide for details. Intrinsic Perk: Rat Pack. This weapon becomes stronger when nearby Fireteam members also have it equipped. Stacks up to 6 times. Although Sidearms are the weaker weapon class, Rat King certainly has some excellent perks. The "Rat Pack" perk grants a stackable damage boost depending on the number of players within the Fireteam who have it equipped. It's trait perk is also highly interesting. Called "Vermin" the perk turns the player invisible when reloading immediately following a kill. How to get it: See the Rat King exotic guide for details. Type: Kinetic - Auto Rifle. Intrinsic Perk: Payday: Larger magazine. Increase accuracy when firing from hip. 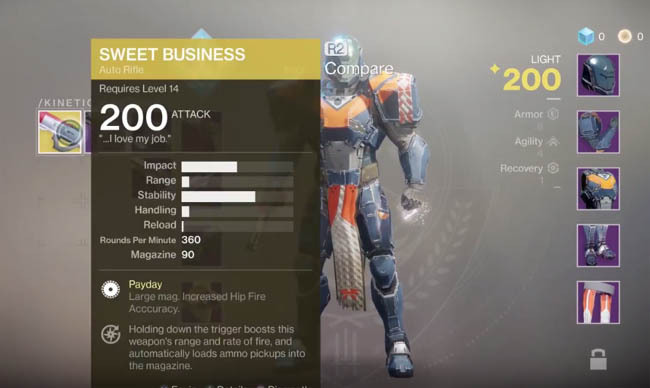 Sweat Business is a new exotic auto rifle, first showcased at the reveal event. This auto rifle has kinetic damage and exceptionally high hip fire accuracy, behaving a little like a mini-gun or rattling cannon. It speeds up over time, with a "Transversive Steps" perk that allows for picked up ammo to be put directly into the mag. Interestingly, Sweet Business was originally in the Destiny 1 files as a shotgun before being renamed to the The 4th Horseman when the Dark Below came out. Intrinsic Perk: Harsh Truths. Fires a 5 round-burst. When a nearby ally is killed, gain health regeneration and increased movement speed. As you can see, Vigilance Wing fires an improved 5 round-burst with bonus health regeneration when your team is in trouble. It's trait perk also follows a similar pattern, providing the wielder with improved weapon performance when they are the last member alive in a Fireteam. Intrinsic Perk: Cold Fusion. This weapon shoots a steady cold fusion-powered laser. An DLC pre-order bonus weapon, Coldheart shoots a unique cold-fusion powered laser. It's trait perk called "Longest Winter" also relates to the laser itself, offering players exponentially more damage the longer the it remains on target. How to get it: Complete the main story then visit the Tower vendor for the reward. For physical disc copies remember to enter your DLC code first. Intrinsic Perk: Delayed Gratification. Grenade projectiles will bounce off surfaces. Hold down fire to launch and release to detonate. The first exotic grenade launcher that we have seen in Destiny 2. Fighting Lion has a tactical exotic perk that allows grenades to bounce off walls and other surfaces, then players can detonate at will. It's trait perk called "Thin the Herd" means that direct hits with this weapon do more damage to shielded enemies. Rapid kills against grenade damaged enemies will refill the magazine. Type: Energy - Submachine gun. Intrinsic Perk: Arc Conductor. When taking Arc damage, this weapon becomes more powerful and resists incoming Arc damage. Damage kills extend the time in this overcharged state. One of the new exotic submachine guns in Destiny 2. 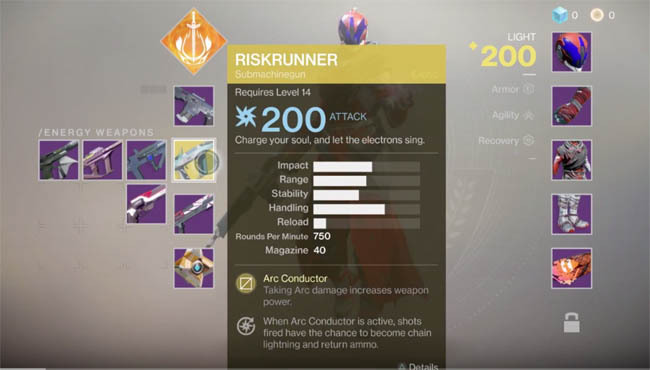 Risk Runner has two interesting perks; "Sunburn", taking Arc damage increases power, and an exotic perk, when Sunburn is active shots have a chance to cause chain lightning much like Zhalo Supercell from Destiny 1. How to get it: Available as a reward in the main story, or through exotic engrams. Intrinsic Perk: Black Hole. Third shot of the burst rips a hole through spacetime, doing high damage and recoil with no fall-off. Like your typical pulse rifle, the Graviton Lance fires a burst of three-shots, but thanks to its exotic perks the third and final shot has higher recoil, damage, and on kills it releases a mini black hole that travels past the target causing havoc. What I also love, is the humming sound the Lance makes, much like a guitar amp that's just been switched on. Intrinsic Perk: Slug Rifle. This weapon fires Solar slugs that get stronger when aiming down sights. Certainly one of the better exotics, Skyburner's Oath fires bullets that are inherently stronger while ADS. It's trait perk is also a beauty, providing full auto with extra damage to Cabal and penetrating Phalanx Shields. The perfect weapon for the Leviathan Cabal raid is it not? Intrinsic Perk: Sunburn. 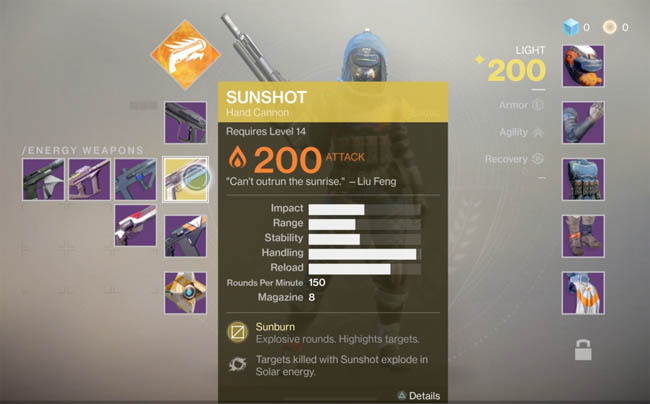 This weapon fires explosive rounds and highlights targets that take damage from sunshot. An exotic handcannon that has explosive rounds as it's base perk, exploding enemies on contact much like the firefly perk. Its exotic perk behaves similar to Ice Breaker, causing enemies killed with Sunshot to explode in Solar energy. How to get it: Available as a reward during the main story, or through exotic engrams. Intrinsic Perk: Personal Assistant. Aim at an enemy to view its health and other critical information on the scope. Although an exotic Sniper Rifle is usually welcome news (thinking back to Ice Breaker), it's hard to judge the effectiveness of DARCI's exotic perk. Simply knowing an enemies health and other critical information isn't something which stands out from the rest of the exotics on this list. It's trait perk called "Target Acquired" works in tandem with "Personal Assistant" offering better target acquisition and more precision damage when aiming. Time will tell. Intrinsic Perk: Conserve Momentum. Non-lethal kills with this weapon make it charge faster until it's wielder does get a kill. A compensatory fusion rifle that benefits drawn out fights and tough to crack opponents. Merciless offers faster charge rates for non-lethal kills through its exotic perk, and through it's trait perk, "Impetus", the wielder gains increased weapon damage when reloading immediately after a kill. Intrinsic Perk: Shock Blast. This weapon fires blasts of high-damage Arc energy that over penetrates enemies. A real brute force weapon, the Legend of Acrius has a a great sounding exotic perk which offers high damage and over-penetration. You can almost imagine storming a tight group of enemies with this weapon. It's trait perk, "Long March", will help you pick out groups of enemies by allow you to detect enemies on your radar from further away. Intrinsic Perk: Excavation. Hold fire to shoot grenade. Release to detonate all live grenades simultaneously. A great weapon for launching a barrage of grenades at a defined area and then timing their explosion perfectly, which would seem perfect for known encounters such as Strikes and Raids. It's trait perk called "Full Auto" does as the name implies, turns the weapon into a fully automatic launcher. Intrinsic Perk: Mad Scientist. This weapon fires a volley of rockets. Originally found in the Destiny 1 game files, the "Dubious Volley" or "Last Exotic", as it was fondly referred to as, was one of the final exotics that was never discovered in the original game. 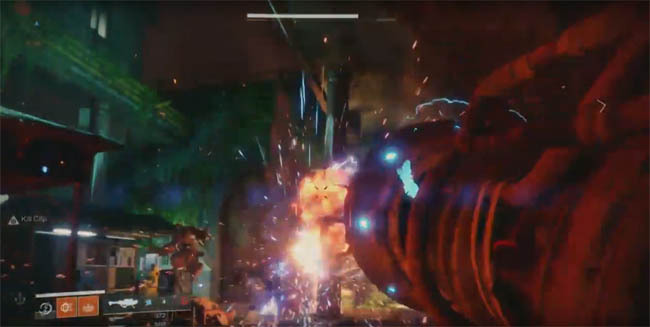 During the reveal event, Bungie showed a short walkthrough of the Homecoming mission, with a player showcasing the "Wardcliff Coil" exotic for the first time. Upon its brief appearance, the live crowd cheered as the telltale volley of rockets flew across the screen. The weapon itself has Arc damage and fires a "volley" of small rockets, consuming only a single unit of ammo in the process. It's trait perk "Mechanized Autoloader" will reload the weapon automatically whenever ammo is picked up. Intrinsic Perk: Repulsor Force. This weapon fires a powerful impulse to push enemies away. Another brute force weapon that can literally push holes through a group of tightly bunched enemies, thanks to its "Repulsor Force" exotic perk. Backed up by it's trait perk called "The Scientific Method", this weapon gains a temporary speed and handling boost when damaging an opponent. Intrinsic Perk: Mida Multi-Tool. This weapon boosts movement speed. The classic ADS radar providing exotic is back in Destiny 2 and NO it still doesn't come with a golden chest detector! MIDA was a lifesaver in Destiny 1, especially allowing players to speed past the hive in the Dark Below raid. Can it live up to its name again in Destiny 2? How to get it: See the MIDA exotic guide for details. Intrinsic Perk: Volatile Rounds. Shots fired from this weapon have no damage falloff, over-penetrate targets and ricochet off hard surfaces. Hard Light returns to Destiny 2 but this time as an Energy weapon. It still has the same classic exotic perk but it's new trait perk allows players to freely switch between Arc, Solar or Void damage types at will.